It's welcome news that The Who are coming to Belfast as part of their UK/Ireland tour in June 2013. Most of the concert will concentrate on performing the album Quadrophenia - The Who’s 1973 rock opera - in its entirety. The music and songs reveal the wealth of musical ideas Pete Townsend was capable of producing that contain extraordinary vision, considerable emotional range, passion and sound. As usual, the rhythm section of Keith Moon and John Entwistle is excellent and Roger Daltrey's vocals are buoyant and flow with great intensity and dynamism. I believe the album contains some of Pete Townsend's most inspired, remarkable and original guitar playing. I was fortunate to see The Who perform at the Isle of Wight Festival in 1970 in what proved to be one of their most iconic performances. The sound was amazing and their marathon set - which included 'My Generation', 'Summertime Blues', 'Pinball Wizard', 'Young Man Blues', Substitute', and excerpts from Tommy - was incredible. It's impossible to capture on vinyl, CD, or DVD, the atmosphere, power and emotion that a 'bona fide' rock band create during a 'classic' performance. The Who, however, came close with the release of Live at Leeds in 1970. It remains one of the greatest recordings of a 'live' concert by a rock band. The playing throughout the 'vinyl' version of the performance is inspiring and the group reach tremendous heights which allow the music to speak for itself. Truly exceptional. 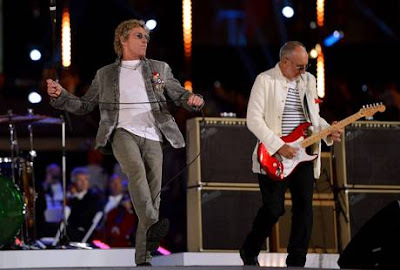 Pete Townsend and Roger Daltrey will be supported in Belfast by Scott Devours on drums, Pino Palladino on bass, Pete’s brother Simon Townshend on guitar, a trio of keyboard players, and a brass section.